(Photo: REUTERS / Goran Tomasevic)South Sudan's rebel leader Riek Machar (R) and South Sudan's President Salva Kiir (L) hold a priest's hands as they pray before signing a peace agreement in Addis Ababa May 9, 2014. Securing long-term peace in South Sudan requires much more than deals between political leaders, a new study of the world's youngest country by the UK group Christian Aid warns. The seventh anniversary of the country that was once part of Sudan fell on July 9. "It's understandable that diplomats, donor governments, and the international community focus their efforts and hopes on securing a deal between powerful men around the negotiating table. "But history shows that focusing on high-level processes has failed to bring peace for people in South Sudan," said Natalia Chan, Christian Aid's Senior Adviser on South Sudan. The report is titled "In it for long haul? 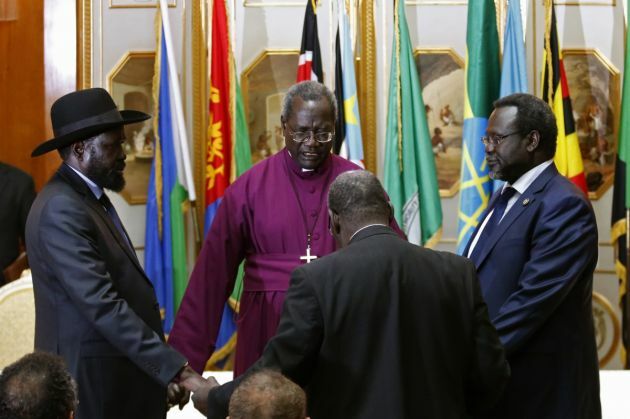 Lessons for peace-building in South Sudan." The country's president Salva Kiir and rebel leader Riek Machar have been engaged in high-level peace negations in Khartoum, the Sudanese capital. Kiir has agreed to reinstate Machar as his first vice president, after talks in Kampala, Uganda last week. Machar's team reportedly agreed to the creation of a new post of a fourth vice president. On June 27, the two politicians and other groups signed a declaration agreement which paved the way for a permanent ceasefire, Kenyan journalist Fredrick Nzwili reported for the World Council of Churches. This week UN Human Rights monitors said they have documented what appears to be deliberate, brutal attacks on civilians, particularly against women and children, by government forces as well as armed youth in parts of South Sudan. Ravina Shamdasani spokesperson for the UN High Commissioner for Human Rights told journalists that a new report documents acts that constitute gross violations and abuses of international human rights and humanitarian law that may amount to war crimes. The investigation also identified three individuals who may bear the greatest responsibility for the violations committed in parts of South Sudan's Unity State. "One of them was reportedly removed from his functions for his alleged implication in these violations," said Shamdasani. The violence took place after clashes between government forces belonging to the SPLA and associated forces, and opposition forces from the SPLA-IO (RM) in Unity State. "Civilians were targeted, with the elderly, people with disabilities and very young children killed in horrific acts of violence – some hung from trees and others burned alive in their homes, the investigation found," the report says. The report documents the use of sexual violence as a weapon of war, with at least 120 women and girls raped or gang-raped, including children as young as four. One 20-year-old woman was still bleeding from childbirth when she was raped. The military offensive was part of a broader cycle of violence in which opposition forces also carried out armed attacks resulting in civilian casualties. Christian Aid's Chan said, "After four-and-a-half years of civil war that have touched the extreme bounds of violence, the situation in South Sudan remains gravely concerning. "There are multiple conflicts over resources, power and identity. Tens of thousands of people have lost their lives, half the population are at risk of food insecurity, and a third have been forced to flee their homes. Chan said Christian Aid is suggesting the need for a more sophisticated recognition of the conditions for peace. "These include the critical roles played by leaders and peace activists at regional and local levels. "The local really matters. So do the many cultural and religious practices that can help defuse potential explosions and heal relationships after decades of trauma and deep grievance." The report says, "Peace is made and broken every day in South Sudan by chiefs, youth, women and commanders, under trees, in offices, in person or by mobile phone. It is occasionally still facilitated by letter, carried across a boundary by willing hands. "Yet, the countless peacemakers at the local level are obscured by the tendency of international and higher-level actors to put themselves towards the center of analysis." As a result, it says chances are missed to resolve some of the problems caused by competition for power at national level. "It's easy to despair or be desperate for a quick-fix to the horror," Chan noted. South Sudan descended into civil war in late 2013, and the conflict has trigged one of the fastest growing refugee crises in the world. The UN estimates that there are about 4 million South Sudanese displaced internally and externally.